We came to this little Provencal village looking for a letterbox. The box, which had been hanging in some greenery on a boulder, had succumbed to an anti-ivy campaign. But as we have experienced so often when we're searching for a letterbox, we found so much more. Dominated by two high cliffs, the village of Moustiers Sainte-Marie dates back to the fifth century when monks moved into caves and built a monastery. By the 12th century houses and fortifications were constructed, and the chapel of Notre Dame de Beauvoir (Our Lady of the Rock) was built high on a hill overlooking the town, the same site where a Marial temple sat in the fifth century. Today visitors can climb a series of 262 rugged stone steps to reach the chapel and to enjoy a long-range view of the valley below. Located at the entrance of the spectacular Verdon Gorge, Europe's deepest canyon, Moustiers is flanked by the emerald green Sainte-Croix Lake and the Plateau of Valensole with its aromatic lavendar fields and golden wheat. 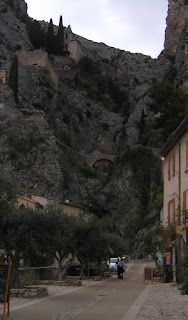 Vehicular traffic in the village center is limited to residents, and Moustiers is a great strolling town. Many shops and some very fine restaurants line the narrow streets. On Friday mornings, the village plays host to market day with the sights and smells of local Provencal produce and flowers. Above all this charm, strung between the two limestone cliffs which stand guard over the town is a four-foot star painted gold. According to local legend, a knight, the son of a local family, was captured in Syria during the Crusades. 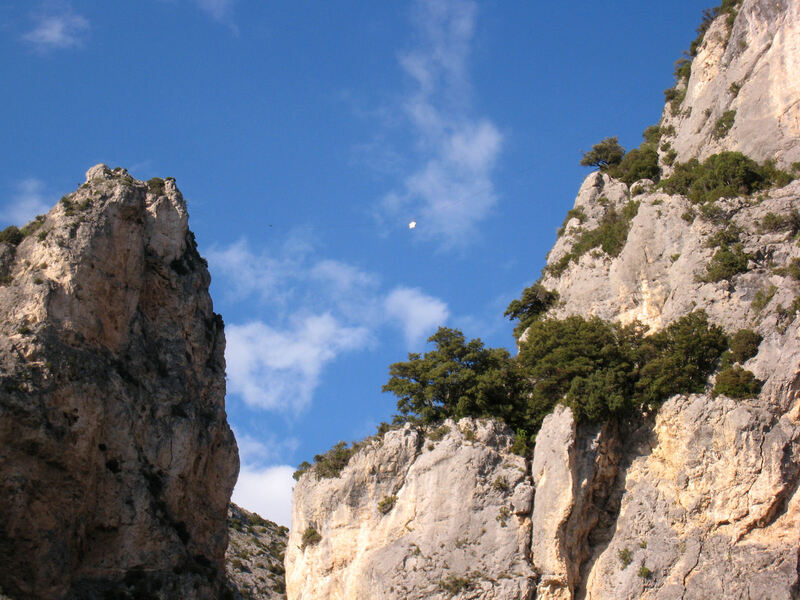 While a prisoner, he vowed that if he returned to the village, he would hang a star between these cliffs as an homage to the Virgin Mary. Other versions of the legend feature love stories or kings of chivalry. In fact, no one has been able to verify the true origin of the star, but it has hung suspended on a chain over the town for more than four centuries and is replaced when its chain disintegrates. The current star was hung in 1957 by a helicopter; no one knows how the original was put in place. 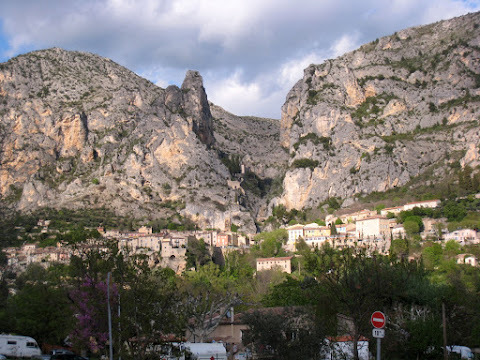 For our introduction to the villages of Provence, Moustiers Sainte-Marie was the perfect star-t.